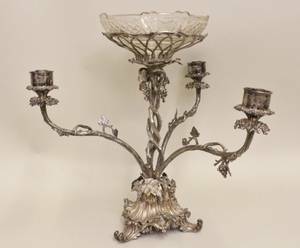 Ornate silverplated epergne centerpiece decorated wih grapes, grape leaves and vines throughout. Three candle arms extending from twisted vine form raised on three scrolled form feet. At top center rests a clear decorated bowl in an open work metal basket form. Unmarked. Height 21 inches.